In very elderly patients, less aggressive skin cancers on the face might not always need to be treated, a new study suggests. Age of the patient and relative lifespan could be taken into consideration when discussing treatment for slow-growing facial nonmelanoma skin cancer, say the authors. “There are multiple ways to treat, all cancers aren’t the same, and skin cancer more often . . . is not lethal,” coauthor Dr. Sunil Tholpady of the Indiana University School of Medicine in Indianapolis told Reuters Health. 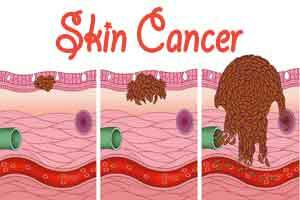 Non-melanoma skin cancer refers to squamous cell carcinoma or basal cell carcinoma, Tholpady explained. “The decision to cut them out or treat them in some fashion should take into account the patient’s lifestyle, their needs, and their wishes as long as they understand what the course of the cancer usually is,” he said. Tholpady and his colleagues studied 440 adults over age 40 with 569 non-melanoma skin cancers on the face. About 55 percent were basal cell carcinomas and 30 percent were squamous cell carcinomas, they reported in JAMA Surgery. Overall, in about a third of the cases, there was no cancer left in the skin after the lesion was removed for the biopy. This was true for roughly half of patients over age 90. During the next several years, 50 patients died. Not surprisingly, the largest percentage of deaths was among patients in their 90s. No one died of the skin cancers, however. In more than one in three patients above age 80, and in more than half of those above 90, simply removing the lesion for biopsy left the patients cancer-free. In other words, the researchers say, “a large minority of patients” would not have needed more extensive treatments. Treatments for non-melanoma skin cancers range from immunomodulatory creams, to destructive therapies such as freezing, burning, shaving and lasers, to surgery, said Tholpady. Further, his team points out, more than half of the patients who were in their 90s died within a year. ”These small (cancers) would never have caused a problem,” the authors write. Given that half of these oldest patients were free of cancer after their biopsies, “a strong argument can be made for a watchful-waiting approach for the amenable nonagenarian,” they add. Dr. Brian Gastman, director of melanoma surgery at Cleveland Clinic in Ohio, said a lot of money is spent every year on non-melanoma skin cancer, much of it in the elderly. “Particularly in the oldest-old, life expectancy “in theory would be much less than any non-melanoma skin cancer would take to actually cause death, and many are not generally life-threatening,” Gastman told Reuters Health by an email. The idea that some non-melanoma skin cancers in elderly patients can be monitored without formal treatment is “intriguing,” said Gastman, but the new data are not definitive enough to change the standard of care. “Future studies are needed to investigate if a watchful-waiting approach is cost-effective and has higher patient satisfaction than surgical excision in this elderly population,” they conclude.